SINGAPORE (THE BUSINESS TIMES) - For serious food-seekers, autumn is the best time. As the year draws to an end, both flora and fauna gear up for the cold winter months and are at their peak, ripe for the picking. Thanks to the wonders of air-freight, even our season-free city gets to enjoy the spoils, with kudos to resourceful chefs who rely on their special connections to bring the best to their tables. Here's what's in their goodie baskets. At Ki-Sho, chef Kazuhiro Hamamoto flexes his networking muscles in Japan to secure the very rare and sometimes "money-cannot-buy" keiji for his best customers. Keiji is a smolt that follows the mature male salmon back to its spawning grounds and is caught along the way. Smolt are young salmon which leave the river during spring and head out to the open sea. During this time, they grow extremely fast so that they're big enough to ward off predators. The smolt turn into salmon when they are ready to return to their breeding grounds. However, not all them have reached sexual maturity when they follow the other salmon back. This is a rare occurrence, and usually only one among 10,000 or even 20,000 mature males is a smolt. Since keiji are sexually immature, they tend to be "fatter" than grown salmon. Hence their meat is sweeter and more delicate in taste. 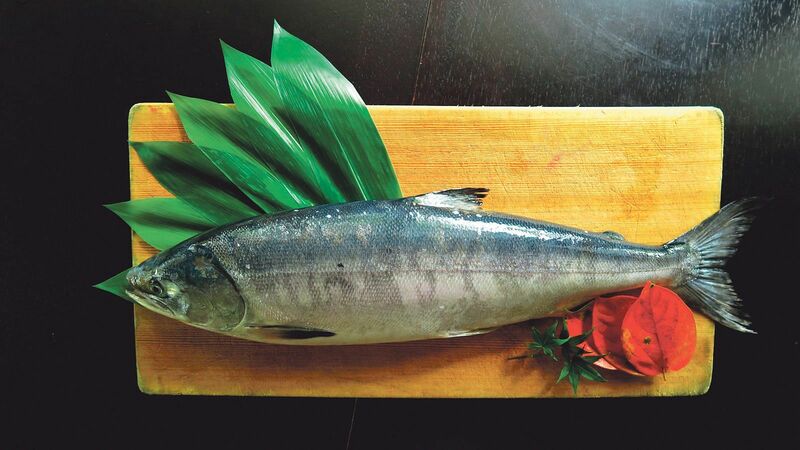 Chef Hamamoto found this keiji, which are on average two years old, from the northern part of Hokkaido, and they weigh about 2-3 kg each. The most obvious physical difference between a smolt and an adult male is that the younger fish does not have the "kype" or hook-like lower jaw, and its flesh is lighter orange with a pinkish hue. Being young, its flesh is also tighter and firmer. Chef Kazuhiro prefers to lightly cook the meat at low temperature, shabu-shabu style, to preserve its velvety texture, and it is served with a home-made light sweet shoyu. Chef Tomoo Kimura is currently serving sujiko, which looks like but is not ikura. They may look the same at first glance, but sujiko has a more intense reddish colour. Technically they are both salmon roe, except that sujiko is still within its egg sac. Ikura is mature roe and look like shiny orange balls. These tiny 'bubbles' are full of flavour and filled with the taste of the ocean. While the ruby-like Sujiko is sweeter in taste, it's harder to manage, hence they are best enjoyed as sushi in the hands of an experienced sushi chef. Chef Kimura says that the best time to enjoy sujiko is between September and December, and they harmonise perfectly with sake. Even Amamoto Café, a take-away beverage counter in Raffles Place, has joined in the autumn celebration with its focus on Japanese chestnuts, currently in season from October to November. Called 'kuri' in Japanese, or the French word 'marron' if they are used in Western-style desserts, chestnuts have been cultivated in Japan for centuries. People from as far back as the Jomon period (14000 to 300 BC) used wood from chestnut trees for their homes. Amamoto Café blends chestnuts with amazake or koji-mould, making an alcohol-free beverage with no added sugar. The koji-mould is first spread over steamed rice to start the fermentation process, and produces what is called koji. Water is then added to the mixture and the temperature kept at 60 deg C, which is optimal for the growth of at least 100 types of enzymes. These enzymes in turn produce essential amino-acids, oligosaccharides, vitamins, minerals, and a host of other bio-chemicals that are beneficial for the body's repair, nutrition and health. The entire process lasts approximately 12 hours. While amazake-drinking dates back to the Kofun period in Japan (250-538 AD), it only became widespread in the Edo period (1603-1868). For autumn, Saint Pierre is bringing in the rare Figue de Sollies, or purple fig, as an ingredient for its desserts. Fig Sollies is a fig cultivator native to Toulon, in the southern region of France. This teardrop-shaped, purple-ribbed fig has an elegant top note, along with light vegetal and fruity notes of watermelon, strawberry and other red fruits. The pulp is fleshy and filled with many fine beige seeds, with a tangy fruity flavour. Chef Emmanuel Stroobant transforms this fruit into a fig compote with fresh balsamic vinegar-marinated figs and a homemade milk sorbet for a perfect balance of sweet and sour. Each year, the pre- and post-Autumn Mooncake Festival brings two delicious things in its wake: the namesake pastries, and hairy crab. These hairy or mitten crabs - named for their furry claws - come into spawning season around the time of the festival. They're bursting at the seams with roe, which explains why they're so sought after at this time. At Yan Restaurant, instead of importing hairy crabs from Yang Chenghu lake region in Suzhou, it is serving their Dutch counterparts. These European crabs live in a more natural breeding environment, as the waters in Holland are pure and unpolluted, leading to meatier and bigger crabs. There are some golden pointers when choosing hairy crabs: Look for one with a green shell and white belly, yellow hair and golden claw, and with alert eyes. Most important, regardless of size, the crab must feel heavy because it is an indication that the crab is filled with plenty of roe. Anyone familiar with hairy crab will know that there are two types of roe: the orange, female roe; and the whitish "roe" of the males. The hard orangey roe of the female crab is rich and bursts with umami in every bite while the male "roe", which is often soft and creamy, is subtly rich and smooth. During its hairy crab promotion which starts in mid-November, Yan Restaurant also serves hairy crab in different ways such as steamed xiao long bao and poached Japanese noodles with fresh crab meat.